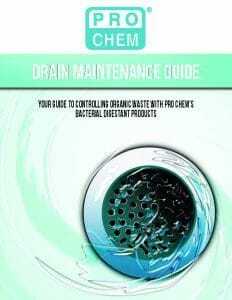 DRAIN CLEAR | Pro Chem, Inc. DRAIN CLEAR is a liquid, nonacid drain opener and maintainer with a formulation of potassium hydroxide and other synergistically blended chemicals. This unique formula will not form a hard soap in drains that are stopped with grease making it perfect for use on clogged and slow flowing drains. Unlike other potassium hydroxide drain openers, this formula clears drains in half the time, saponifying the grease into a soft mass that is easily flushed through drains. A safer alternative to acids, no dangerous mixing is necessary with this ready-to-use formula. 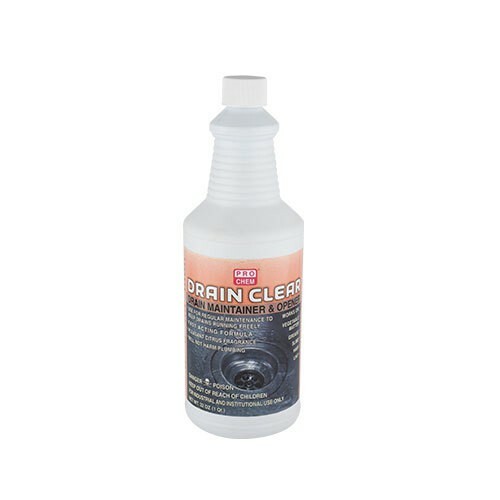 DRAIN CLEAR provides a pleasant citrus fragrance while effectively clearing hair, uric salts, grease, cold-water slime and other organic matter. Use for regular maintenance to keep drains running freely. Shake well before using. Remove as much water from the basin as possible. Slowly pour this drain opener directly into the drain. Let stand 15 minutes. Flush with tap water. This product gets drains clean from sink to sewer or septic tank by dissolving grease, lint, hair and other organic matter. CAUTION: DO NOT USE IN ALUMINUM VESSELS.